Claudia and Josef are two married and successful New Yorkers who once seemed to have it all; Josef is a surgeon, and Claudia is an editor. Three years after the sudden death of their one-year-old daughter, however, the couple is barely hanging on. The Other Room begins amidst this devastation. Claudia is now seeing a therapist regularly — this “other room” is the only place where she can communicate the extent of her grief and longings — but her work is slipping. Aside from her therapist, Stuart, everyone else just sees her as a shell of her former self. Meanwhile, Josef has become angrier and more at a loss as to how to connect with Claudia, who blames him for their daughter’s death; Lily suffocated in their bed. Their relationship was once sexually charged; Claudia is now reluctant to sleep with him, instead secretly turning her sexual fantasies towards her therapist. Josef begins an affair with one of the nurses who works with him, at turns craving an intimate connection with someone and, deep down, spitefully hoping to draw some kind of emotional response from his apathetic wife. All of this is laid out using alternating points of view, mostly between Claudia and Josef. Some of the chapters are excerpts from Claudia’s journal entries, revealing secrets about motherhood and marriage and sexual desire that no one else knows. Readers get to learn why she’s so aloof in the years following her daughter’s death. Our daughter died when she was one, her arms and legs still ringed with cushions of fat, her mind still straining with the mysteries of the English language. When she woke in the mornings she smelled of baby sweat and urine, black ringlets of hair plastered against the side of her face, head and shoulders hanging slack over the side of her trundle bed. We both used to lie with her there — sliding into sleep most nights while her breathing slowed and steadied beside us, curling tight to the warmth of her small body like two hands cupped carefully around a flame. The tension builds slowly, until it finally explodes in one very intense Thanksgiving confrontation. My only problem with the book was its resolution. I won’t give anything away, but I thought the ending was questionable given the unflinching realism of the rest of the novel. It ended up being a little too tidy for my liking. 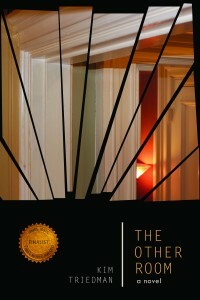 The Other Room was published on October 8, 2013 by Owl Canyon Press.